Frame It All Classic 1? 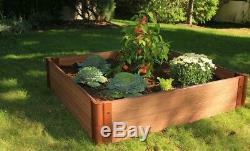 Profile 4 ft x 4 ft Raised Garden Bed. 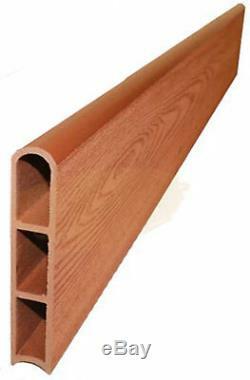 Eco-friendly timbers are made from recycled plastic and natural fibers. Frame It Alls modular system allows endless design options. You can add on or reconfigure your raised garden bed at any time using existing or additional two inch series Frame It All components and accessories. Low maintenance-timbers will not rot, warp, splinter or fade. Material Details: Recycled plastic and natural fibers. Overall Product Weight: 40 lbs. Overall Height - Top to Bottom: 11. Overall Width - Side to Side: 48. Overall Depth - Front to Back: 48. The item "Frame It All Classic 1 Profile 4 ft x 4 ft Raised Garden Bed" is in sale since Saturday, August 11, 2018. This item is in the category "Home & Garden\Yard, Garden & Outdoor Living\Gardening Supplies\Plant Care, Soil & Accessories\Baskets, Pots & Window Boxes". The seller is "wayfair" and is located in Sparks, Nevada. This item can be shipped to United States, Canada, United Kingdom, Denmark, Romania, Slovakia, Bulgaria, Czech republic, Finland, Hungary, Latvia, Lithuania, Malta, Estonia, Australia, Greece, Portugal, Cyprus, Slovenia, Japan, China, Sweden, South Korea, Indonesia, Taiwan, South africa, Thailand, Belgium, France, Hong Kong, Ireland, Netherlands, Poland, Spain, Italy, Germany, Austria, Bahamas, Israel, Mexico, New Zealand, Philippines, Singapore, Switzerland, Norway, Saudi arabia, Ukraine, United arab emirates, Qatar, Kuwait, Bahrain, Croatia, Malaysia, Brazil, Chile, Colombia, Costa rica, Dominican republic, Panama, Trinidad and tobago, Guatemala, El salvador, Honduras, Jamaica, Viet nam, Uruguay. Overall Width (In): 40 in.